Summer is about three things: road trips, blowing off work to head to the beach and outdoor concerts. There’s just nothing like the live music experience with the sun in your face, a drink in your hand and a cool breeze whistling through the trees. While there are literally dozens of A+ destinations across America to take in an outdoor show this summer, some venues clearly stand in a league of their own. Like these five eye-popping, body-shaking, life-affirming outdoor music venues in America. Originally opened in 1985 as a small winery, the sprawling 27,500-seat Gorge Amphitheatre situated on a high bluff overlooking the Columbia River and the Cascade Range foothills has evolved into one of the world’s most magnificent outdoor venues. Most famous as the site of the annual Sasquatch! Music Festival over Memorial Day weekend, the Gorge Amphitheatre will see acts like Pretty Lights and Kings of Leon this August before Guns N’ Roses rolls into town Labor Day weekend. With on-site camping (as well as glamping) opportunities and lawn tickets in addition to upfront action in the pit, there’s not a bad seat in the house at this Live Nation-managed venue located about 2.5 hours east of Seattle. For eats, they’ve got Guy Fieri burgers and food trucks plus local craft beers from Elysian and Georgetown Brewing. And yes, they’ve still got plenty of wine. This venue has reached mythical status amongst its many loyal acolytes, and anyone who’s ever been there can tell you it’s easy to see why. The 9,000-seat venue located just 16 miles west of Denver overflows with a spiritual vibe that made it a favorite of the Grateful Dead back in the day. Widespread Panic more recently took the jam band mantle for hosting the most sold-out shows in Red Rocks Amphitheatre’s history. 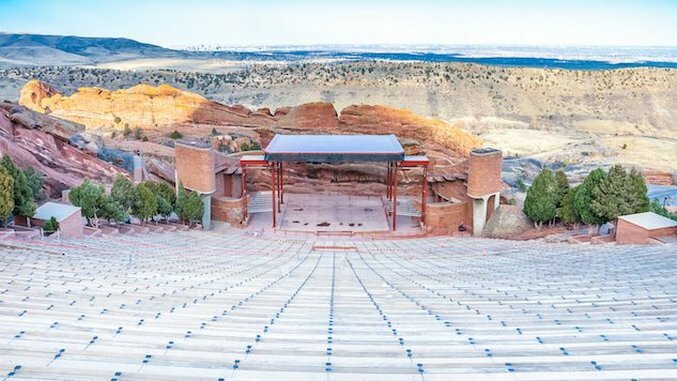 With concerts having been performed for over 100 years in these ideal acoustic surroundings created by the ancient sandstone monoliths that form the stage and seating area, the Denver-owned venue is also a beautiful nature park that you can explore between shows. It also hosts yoga, fitness and film events at 6,450 feet above sea level. This August, take in its typically diverse lineup of shows from A Tribe Called Quest to Father John Misty to Die Antwoord, with Gorillaz rolling into town late September. Despite extensive damage by Hurricane Sandy in 2012, Long Island’s Jones Beach Theater (formerly called Nikon at Jones Beach Theater and today called Northwell Health at Jones Beach Theater, although no one calls it either) may not host the most cutting-edge bands in the world (this August featuring Jimmy Buffett, Lynyrd Skynyrd and Alice Cooper), but the view is damn tough to beat. Proudly serving an array of NY-produced beer and spirits including Blue Point Lager, Oyster Bay IPA and Owl’s Brew Radler, this famous concert pilgrimage site about 45 miles from Manhattan originally opened in 1952 to host musicals and was twice expanded in the 1990s to build more capacity as it transitioned into the rock concert space. This 15,000-seat Live Nation-operated waterfront theater located within Jones Beach State Park has street tacos, burgers and food trucks, not to mention an interesting cast of colorful characters you’re not likely to see strolling down Manhattan’s Fifth Avenue. It doesn’t get much more romantic than an evening of music under the stars at the Hollywood Bowl, the legendary 17,500-seat venue opened in 1922 in a concave hillside with the Hollywood Hills and famous Hollywood Sign forming a picture-perfect background. The summer home of the Los Angeles Philharmonic and the largest natural amphitheater in America, the Los Angeles-county owned cultural landmark has played host to everyone from Abbott & Costello to Fred Astaire to The Doors. This August it brings to the stage acts like Belle & Sebastian, Jill Scott and Herbie Hancock, with Fleet Foxes playing late September. The venue offers stadium seats, box seats up front and bench seats (where you can rent cushions for $1) as well as a ridiculous array of eats from two on-site restaurants as well as street foods stands for pizza, hot dogs, sushi, tacos and more. Show up early and pack your own picnic to enjoy in one of the 14 picnic grounds that surround the venue or, in true Hollywood style, order dinner to be delivered straight to your box. More of an open-air nature retreat than a concert site, the iconic 19,000-seat Merriweather Post Pavilion celebrates its 50th Anniversary season this year with upcoming acts including Alt-J, Santana, Sturgill Simpson and Young the Giant. They will all perform in the picturesque 40 acres of preserved woodlands known as Symphony Woods located in the town of Columbia about 30 minutes south of Baltimore. Famous for legendary classic rock shows back in the day from acts like The Who and Led Zeppelin, the site was more recently made famous by the 2009 album named after the venue from Baltimore’s favorite experimental rock weirdoes Animal Collective. The stunning Frank Gehry-designed venue is unlike most concert spaces you’ve seen, with solar panels powering the house lights and an on-site “music pinball arcade.” Seeing a show here is, as they say, as easy as a walk in the park.